Plants and animals—key building blocks of natural communities—face ecological threats that natural resource managers and volunteers are tasked with stewarding. 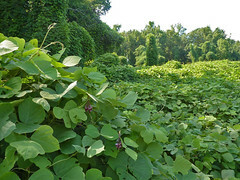 Kudzu can dominate large areas to the exclusion of all native plant species. Photographer: Flickr user reophaxIn many natural areas, non-native invasive plants and problem insects are threatening the natural communities . Non-native invasive plants such as kudzu can smother natural vegetation and destroy habitat needed by native animals. Non-native insects such as the gypsy moth can kill mature trees. Non-native diseases, such as chestnut blight and Dutch elm disease, are also a problem for natural communities in parks and other natural areas. Native plants and animals have little or no immunity to these foreign pathogens. A big shift in population dynamics of a native species can also cause trouble. 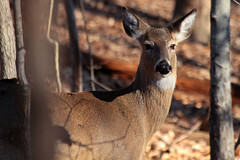 A population spike of white-tailed deer can be catastrophic to other animals and plants in natural communities. Photographer: Sam Sheline, courtesy of NatureServeA good example is the white-tailed deer, whose population on the east coast has skyrocketed due to the local extinction of natural predators such as wolves and mountain lions, and a decline in hunting by humans. Some plants and animals have already become extinct. Others have been extirpated in particular areas, meaning they can no longer be found there, although they still live in other locations. Park staff work to identify and protect species of concern. ...to learn more about some of the most common ecological threats and how park staff and volunteers are working to reduce those threats.